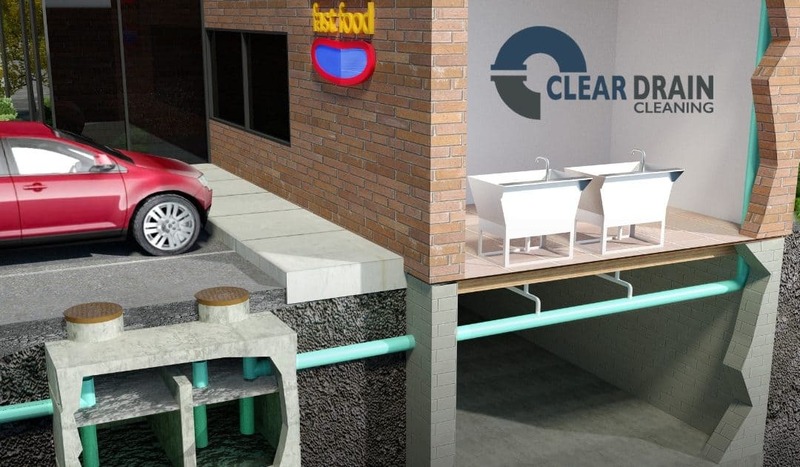 If you’re a restaurant owner, it’s essential to keep your grease traps and drain lines clean. In a restaurant, water from dishwashers, floor drains and sinks flow through your grease trap. Regular grease trap maintenance and drain cleaning are necessary to keep water flowing smoothly through pipes and prevent blockages. Grease traps prevent food, oil, grease and other solid waste from entering disposal lines. Within the trap, a baffle separates the wastewater. Grease entering the trap will settle at the top. Food scraps and other solids sink to the bottom. Many local municipalities require restaurants to clean their grease traps once a month. Ideally, the solid buildup in your trap should not exceed 25% of the total volume of the storage tank. If the 25% is exceeded, this is when solid particles will flow into drain pipes causing blockages to occur. If you don’t keep up on maintenance, blockages and clogged sewer lines could cause unsanitary water to backup within your restaurant. It could even impact nearby businesses, neighborhoods and streets. Why is My Grease Trap Overflowing? Usually, a clogged line on the effluent size of your trap causes overflow. It prevents the water from flowing to the sewer system. If your trap is in bad condition, it can allow grease to pass through the sewer. When this happens, jetting the line and cleaning your sewer normally solves the problem. If you have a clogged line, but your trap is in good condition, you may need to clean it more often. Cleaning your clogged or dirty line is easy with our hydrojetting equipment. High pressure water is forced through your pipes, completely removing debris and buildup from your line. Why Should I Have My Grease Trap Cleaned? In a commercial kitchen, backups can be costly. A clog in your grease trap can cause issues throughout your plumbing system. Your toilets may stop flushing, and a stinky smell could emanate from the kitchen. This is not ideal for an eating establishment. You many even lose revenue if you have to close your restaurant to clean and sanitize the space after experiencing overflowing wastewater. We offer grease trap and drain cleaning services. Using our safe and reliable hydro jetting method, we will clear your drain of all debris. Clear Drain Cleaning is a local owned company that specializes in residential and commercial drain, sewer and septic services such as electric drain cleaning and hydro jetting. Our tools and methods are safe, reliable and fast. We’ll have your drains, sewage and septic systems clear and running smoothly in no time! We proudly serve Holmes County, Wayne County, Tuscarawas County, Coshocton County, Stark County, Ashland County and Carroll County. Contact us today and Like Us on Facebook!